So when one of my mates jumped on board, Second Chance , and declared he, ‘had a good feeling,’ he was almost instantly hurled overboard. It didn’t take long for my worst fears to be confirmed. Prior to, Captain Bruce Parker, turning up in, Second Chance, my three friends and I had stood on Maitiatia pier on Waiheke Island, and looked out at one of the biggest work ups I have ever seen; not more than 500 meters out of the bay. Even as Second Chance bounced gently against the pier and we piled aboard, the action in the bay remained impressive. No sooner had the engines started however the birds stopped diving. Not withstanding this somewhat ominous tiding, we headed out to the action. By the time we arrived it was more akin to a giant avian car park than a full-on work up. Nevertheless, I hurled out a Kahawai lure at Captain Bruce’s suggestion. After our first pass, I had bagged an unsuspecting sea gull that had the misfortune of being my first catch of the day, and took out his displeasure on our skipper by giving him a pretty good bite as he was trying to untangle him. Our second pass was no better. I only managed to haul in an overachieving Yellow Tail that was not much bigger that the lure I was using! As I jabbed myself in the finger with the lure trying to release the little blighter, all I could think about was tying the anchor around the neck of my, ‘lucky charm’ who continued to wax lyrical about our fortunes. If I had been the skipper, I would have turned the boat around then and there, and made for the safety of the harbour before some freak wave came over the bow and sunk us; Posiden’s way of dealing with those who dare tempt the fates. Oh my god! Did the Captain just say he knew a spot that, ‘never failed?’ What was going on? Were we on a fishing boat or attending an optimist’s convention?! I sunk further into my depression. My mate, on the other hand who, up until this point was having a minor crisis of faith, was suddenly buoyed by the Captain’s declaration and was instantly converted to a true believer. Pretty soon my other two friends joined in on the act, and it was backslapping and high fives all the way to the Noises. Optimism poured out of the cockpit in quadraphonic while I sat miserably in the stern, sea water splashing into my face, contemplating the myriad of ways that this trip was going to end in disaster. Yep, he actually said that. I couldn’t believe it either. We were going from bad to worse! Convinced that, ‘Mr Lucky Charm’ had earned the ire of the fates, I based my fishing strategy on trying to distance myself from him as much as possible and hoped that I had not been cursed by association. Where my mate was fishing with a 10kg rod, 40lb nylon line, Black Magic flasher rigs and pilchards, I went with a light set up consisting of a 5kg rod, 10lb braid line, a 20lb trace and a soft bait rig. Fifteen minutes later and with Lucky Charm scoring 4 strikes to my 1, I quietly conceded defeat, and shifted over to an old favourite Black Magic 5/0 flasher rig along with pilchards as well. Within 30 minutes of stopping at our spot (sorry but I have been sworn to secrecy by the Captain! ), pessimism had given way to apathy. 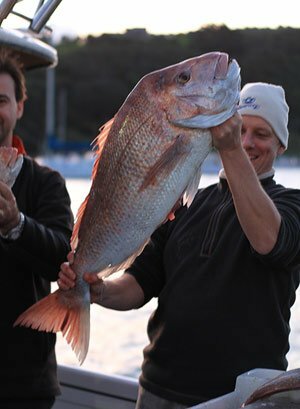 We had about 5 decent fish on board and the official landing size had been raised to 350mm (that is a good sized snapper by the way). Lucky Charm was still banging on, but I didn’t feel like keel-hauling him anymore. Within an hour, apathy gave way to confidence as I landed the biggest snapper I have ever caught; a decent 560mm, 3.4kg (7.5lb) fish! Captain Bruce’s spot was proving a winner. No sooner were lines hitting the bottom, than everyone was getting bites. So buoyant was I, that when, Lucky Charm suggested his mere presence was responsible for my biggest catch, I was actually inclined to agree with him – this was certainly turning out to be a hell of a fishing trip! Two hours into our fishing time and I was a rampant optimist! I was hauling in decent fish after decent fish – nothing less than 400mm! We now had almost 15 fish in the bin, and debate started to rage about raising the landing size to 400mm. It is amazing what unbridled optimism will do, and when I threw back a 510mm thumper, even I was surprised at my magnanimity. Only the wise, Captain Bruce, who has spent more time on the water than all of us combined, understood the gesture, even if I did not. It was a mark of respect, an offering of thanks for our good fortune. Soon more and more fish were going back much to the delight of all on board although when one of my other mates threw back a 540mm monster I thought for a minute that, Lucky Charm would follow the fish in over the side! I don’t know whether it was these simple gestures of thanks, Lucky Charm, a great skipper or the aura of optimism that positively radiated from Second Chance, but three hours into our trip I was hit with the mother of all strikes. My rod came straight up on the strike and the line started running out, steady at first then with a roar as whatever had taken my bait, took off. 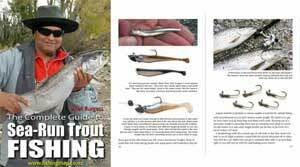 You always know when you have your rod straight up, and it is bent over so far that the tip is below your hands, that you are on to a good thing. Everyone on the boat knew it too. There was little time to stand around and admire the fight that then played out as one by one, everyone’s rod bent in sympathy and pretty soon everyone was occupied with their own fight. When the fish surfaced, I couldn’t believe my eyes! It was the biggest damn snapper I have ever seen. The poor old bugger had fought the good fight, but he was too well hooked and by the time I had him to the surface he was knackered. Where previous fish brought on board had been greeted with laughing and hollering, this Granddad of the ocean was brought aboard to awed silence. I know there are plenty of tall tales about big fish, however the attached photo and tale of the tape tells the real story here; 845mm long, 280mm deep, 9.6kg (21.12lbs). I don’t know who it was that started screaming first, but pretty soon the boat was in an uproar. I feel pretty bad about it, but I kept Granddad. I reason that everyone is entitled to one trophy fish, and to be fair, the poor bugger was in a bad way when we finally measured, weighed and photographed him. Nevertheless, I am left with that strange melancholy that comes over every responsible angler that, ‘bags the big one’ – a feeling I am grateful to have experienced at least once in my lifetime. So what have I learned from this experience? All I can say is, like every trip I make onto the water with my mates, it wouldn’t have mattered whether we had caught a tangle of seaweed and a toilet seat or a bagful of fish. I still would have had an awesome time. As for Lucky Charm? Well I’ll fish with him any day, and he can have as many, ‘good feelings’ as he wants if this trip was anything to go by! By the way, a huge thank you to, Captain Bruce Parker. A better skipper and host you will not find.